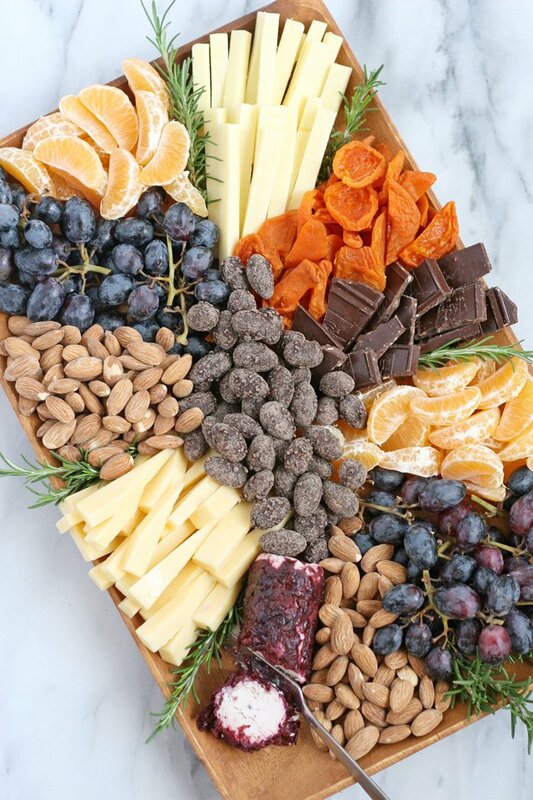 To help you celebrate the holidays in style, I’m sharing how to build a beautiful appetizer platter, filled with fruit, cheese, nuts and chocolates. 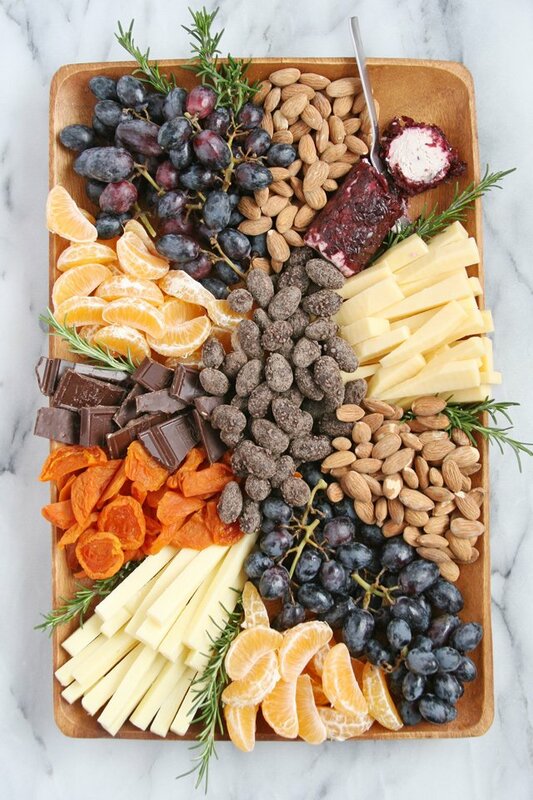 A gourmet appetizer platter like this is sure to be a welcome sight at any holiday party! Of course there are a million ways to assemble a beautiful appetizer tray, so I’ll just share some of my favorite tips, and I hope you’re inspired to create something beautiful and delicious yourself! 1. 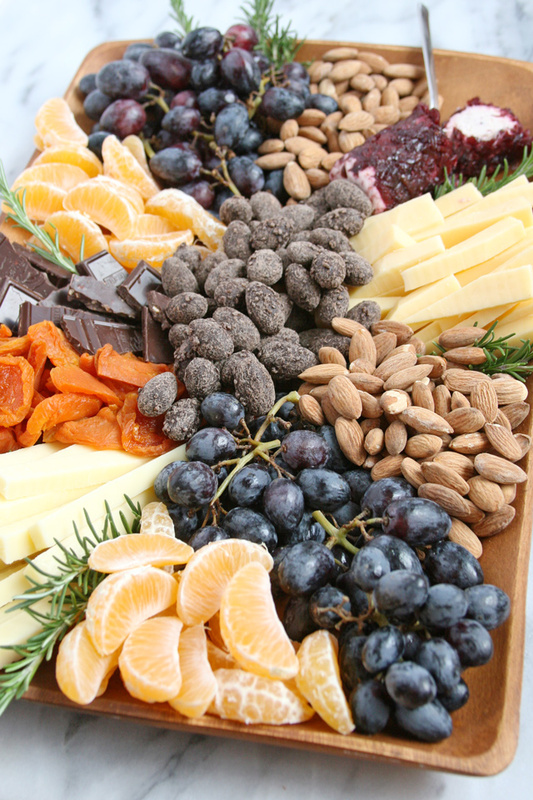 Dried fruit – I chose dried apricots for this platter. I cut the larger pieces in half so it’s nicer as one bite. Other good options would be dried peaches or pears (consider slicing in half or smaller), dried cherries or dried figs. 2. Fresh fruit – I used black grapes and mandarin oranges. Other good options include any grapes (even a couple different varieties on the same platter), strawberries, kiwi, blackberries or large raspberries. Apples or pears are a nice choice if you are able to wait to slice them until just before serving (so they don’t turn brown before being enjoyed). 3. Cheese – I included Gouda, sharp white cheddar and cranberry goat cheese on the platter shown. Choose good quality cheeses that will taste good at room temperature. Lower quality cheeses can sometimes get a little dry and/or greasy when left at room temperature very long. There is a nearly unlimited list of cheeses that would work well on this type of platter. My family likes more mild cheeses, so that’s what I usually do. The goat cheese is mostly for me, because I love it! =) I generally slice the cheeses into little “sticks” so they’re easy to grab, and easy to eat. 4. 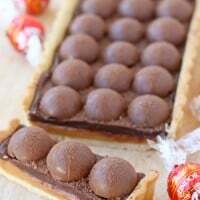 Chocolate – This is the beautiful little surprise on an otherwise quite healthy tray. On the tray shown I used Ghirardelli Dark Chocolate with Toffee and Milk Chocolate with Almonds (sold in large bars in the candy isle at the grocery store) and I also included Chocolate Covered Almonds (with sea salt) from Trader Joes. Again, this is a category with unlimited options. I often like to include chocolate covered fruit, such as chocolate covered cherries. I love the variety of choices at Trader Joes, but most any nice grocery store (or even Target) will have some good choices. 5. 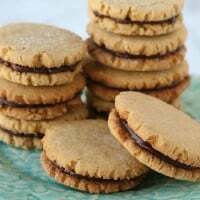 Nuts – I added Dry Roasted (reduced salt) Almonds from Trader Joe’s. Any lightly salted nut, or variety of mixed nuts would work perfectly nicely. 6. Garnish – I added sprigs of fresh rosemary, simply because I have it in my yard. This is optional, but I do love the added color and texture on the platter. Another nice option would be grape leaves (preferably leaves you know have not been sprayed with pesticides), or any organic, edible flowers (likely more available in the spring and summer). Also, a pretty garnish option would be to include some candies on the platter that are wrapped in a shiny foil wrapper (such as Hershey’s Kisses, etc). The bright foil would be a pretty element. 1. Wash, slice, peel (as appropriate) the fruit and lay out of a clean towel to dry. As appropriate, use the towel to dry the fruit. You don’t want excess water from the fruit getting onto other elements on the platter. 2. Slice the cheeses, as desired. 3. 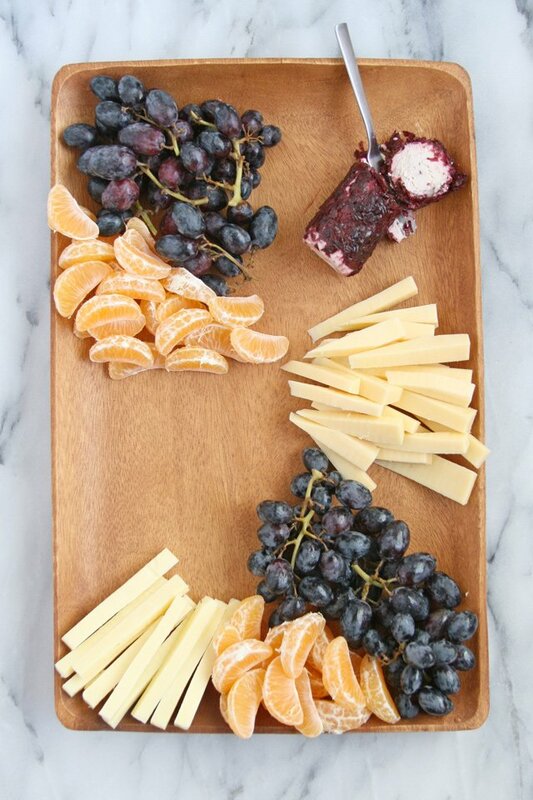 Begin assembly by adding the fruit, then cheeses in sections on the platter. Group items together, but you can have more than one section of the same items (you’ll see two sections of grapes, and two sections of mandarin segments on the platter pictured). 4. Continue filling in the platter by adding sections of dried fruit, then the nuts and chocolates. Keep color in mind as you assemble. You’ll see that on the platter pictured, I’ve spread the orange colored elements, as well as the purple, brown, and lighter colored elements somewhat evenly around the platter. 5. Add garnish, as appropriate. I added the rosemary last, but if you are using grape leaves or something on the bottom of the platter, obviously you’ll need to add that earlier. Cost – This type of appetizer tray can get quite expensive to make. The fruit will likely be the least expensive item (relative to the amount of space it takes up on the platter), so if you want to keep the cost down, add more fruit and reserve less space for other items. Crackers – Certainly crackers would be a nice accompaniment to this platter. I usually prefer to serve a smaller plate of assorted crackers separate from this fruit & cheese platter mainly because I do not want the moisture from the fruit and cheese to affect the crackers. Prep Time – The bulk of the prep required for this time of tray can be done ahead of time (such as a day in advance). 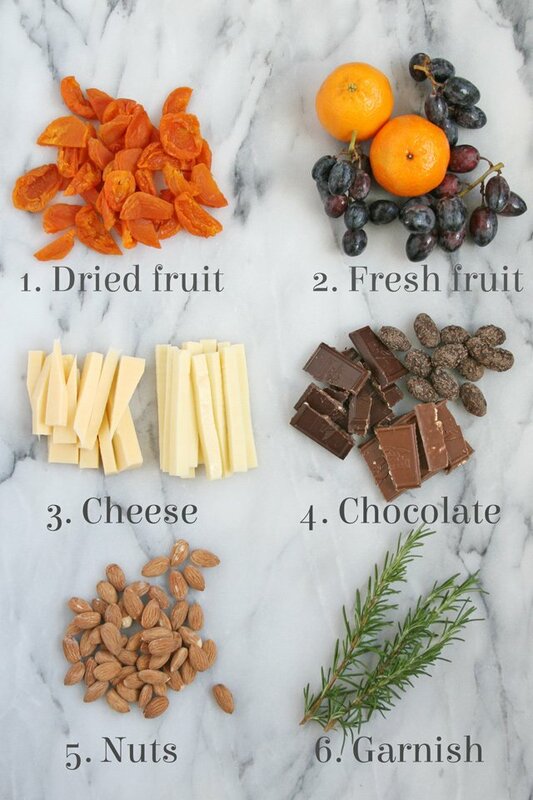 You can slice the cheeses and dried fruit and store appropriately. Also, some of the fruit (especially grapes) could be washed and cut into small bunches ahead of time. Once you have the elements for your platter selected, and cut (as needed), the assembly itself should not take long a all. That platter looks so amazing! 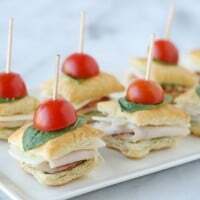 This is a great collection of nibble food for appetizers and a beautiful presentation. I bet the chocolate is the first to go. Have a Happy Holiday ! What a festive and yummy looking tray! Thanks for sharing your great tips! This looks amazing… I love appetizer cheese plates during the holidays! 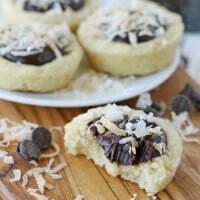 I’ve never thought to add chocolate to mine but I will have to in the future. Sounds like the best combo with a creamy goat cheese like the cranberry one you have!! Wow, this is so pretty! Making trays like this is so great because there is something for everyone in it! This tray is beautiful! I pinned it for future use. Thanks! !